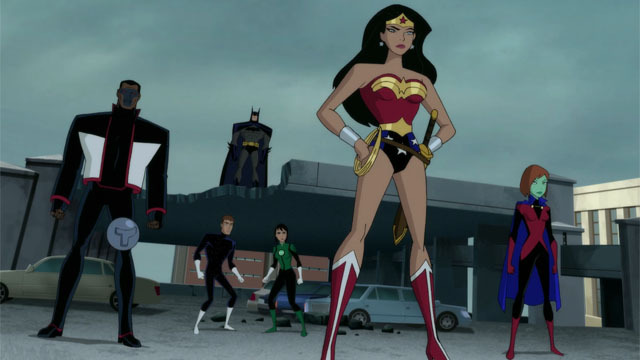 Fans of the classic Bruce Timm Justice League and Justice League Unlimited animated series are in for a treat this year. Justice League vs. The Fatal Five is bringing back Kevin Conroy as Batman, Susan Eisenberg as Wonder Woman, and George Newbern as Superman. But it’s not quite the team you remember. Mr. Terrific (Kevin Michael Richardson) and Miss Martian (Daniela Bobadilla) appear to have taken Martian Manhunter’s role on the team. And neither John Stewart nor the Flash are anywhere to be seen. But that’s far from the only change in the first trailer. In the clip below, the Fatal Five arrive from the far future with a plan to drastically change the destiny of the universe. Their first target is Jessica Cruz (Diane Guerrero), a rookie Green Lantern. The Legion of Super-Heroes’ Star Boy (Elyes Gabel) followed the Fatal Five back in time. Unfortunately, Star Boy’s mental stability isn’t what it used to be. But he may be the League’s best hope to defeat their latest enemies. Justice League vs. The Fatal Five will get a digital release on March 30, with a Blu-ray following on April 16. You can watch the trailer below, then let us know what you think in the comment section!